Abstract: Valsartan is a BCS class II angiotensin-II receptor antagonist. Its clinical application is limited by the poor solubility and low bioavailability.1 Pharmaceutical co-crystal is great potential value with modifying the unfavourable physicochemical properties, without changing the molecular structures of drugs.2 Thus in this study, a new pharmaceutical co-crystal of valsartan was synthesized with co-crystal former, vitamin C, to improve its water solubility by mechanochemical method. A high intensity oscillating mill was applied for producing valsartan-vitamin C co-crystal. Multi-instrumental characterizations confirmed the formation of the new co-crystal prepared by high mechanical process, as following: nuclear magnetic resonance, the optical activity test, Fourier transform infrared spectroscopy, differential scanning calorimetry and powder X-ray diffractometry. Meanwhile, the ratio of co-crystal components, which determined by quantitative nuclear magnetic resonance, was found to be 1:1 (valsartan to vitamin C). Eventually, dissolution test were carried in enzyme-free simulated fluid (pH 6.8). It showed that co-crystal of valsartan and vitamin C significantly increased the dissolution rate (nearly 18 times than free valsartan). 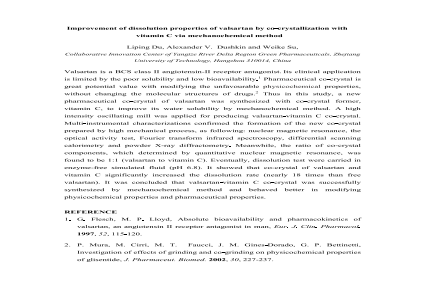 It was concluded that valsartan-vitamin C co-crystal was successfully synthesized by mechanochemical method and behaved better in modifying physicochemical properties and pharmaceutical properties.Summary: Improve the solubility and dissolution properties of valsartan by co-crystallization with vitamin C via mechanochemical method References: 1. G. Flesch, M. P. Lloyd, Absolute bioavailability and pharmacokinetics of valsartan, an angiotensin II receptor antagonist in man, Eur. J. Clin. Pharmacol. 1997, 52, 115-120. 2 P. Mura, M. Cirri, M. T. Faucci, J. M. Gines-Dorado, G. P. Bettinetti, Investigation of effects of grinding and co-grinding on physicochemical properties of glisentide, J. Pharmaceut. Biomed. 2002, 30, 227-237.